This round is all about each achievement showcasing its strengths while exploiting the weaknesses of the opponent. 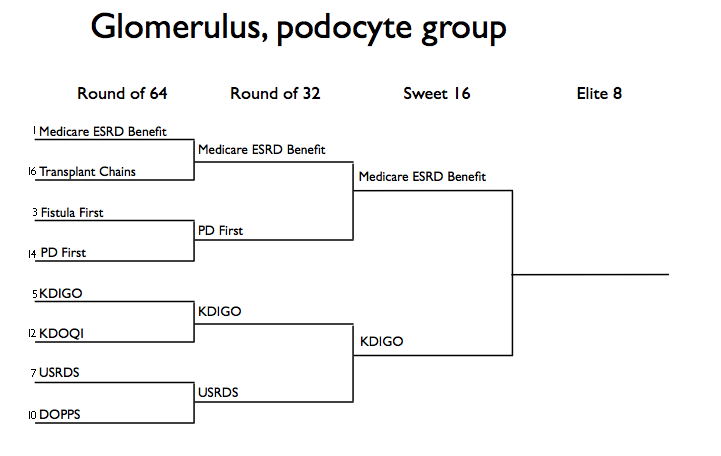 As previously mentioned, Medicare Entitlement for dialysis, is a unique entitlement allowing all patients with ESRD to receive the same benefit, regardless of socioeconomic or health status. This is not to be taken lightly as in many other parts of the world people cannot afford dialysis. Without Medicare’s ESRD entitlement act, lifesaving dialysis would only be offered for those who could actually pay out of pocket for dialysis or had private insurance that would cover it. What can you possibly say about the Medicare Entitlement act that can constitute a weakness? Well for one it is extremely expensive. One year of dialysis costs about $75,000 and the number of patients with ESRD continues to rise. In addition one can argue (as perhaps KDIGO would – if it could…) that it’s a little too much a little too late. Shouldn’t the emphasis be on insuring that people receive appropriate care before they reach ESRD? Also what does the entitlement act say about the best treatment for ESRD – kidney transplantation? Medicare pays for a transplant but only for 3 years of medication coverage – after which socioeconomic status again plays a role – and may contribute to transplant failure. Unfortunately what often happens next is the patient returns to the treatment he can afford, dialysis – thanks to the Medicare entitlement act. 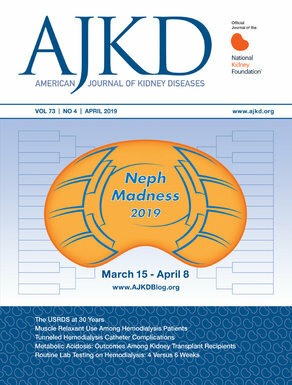 KDIGO challenged the way we view CKD. Not just we nephrologists, but we, all of medicine. Before reporting of GFR many patients with CKD were missed as having a slightly raised creatinine. KDIGO alerted practitioners to the significant of reduced GFR and led to many epidemiologic studies tying together CKD with poor outcomes. The updated guidelines differ from the original by endorsing the CKD-EPI formula, breaking down stage 3 CKD into stage 3a and 3b, and including three degrees of albuminuria (stages A1, A2, A3). Combining these new stages with albuminuria is expected to result in better risk stratification for renal disease as well as cardiovascular disease. And of course they give updated guidelines on CKD management with level of evidence included. Click here for new CKD stage schema. Perhaps the original KDIGO CKD stages were a bit of an overkill. A vast number of patients were newly diagnosed with CKD. This is especially problematic when formulas used for GFR estimation (need I say MDRD) are notoriously bad for estimating GFR over 60. Revisions of the guidelines attempt to rectify this problem but a GFR of 59 is still stage 3 CKD – albeit stage 3a. Adding stages of albuminuria seems like a logical step but only time will tell if the revisions will add real world value to the original schema. Number 8 seed Epigenetics continues down a path of destruction in a region littered with research techniques and statistical tools. 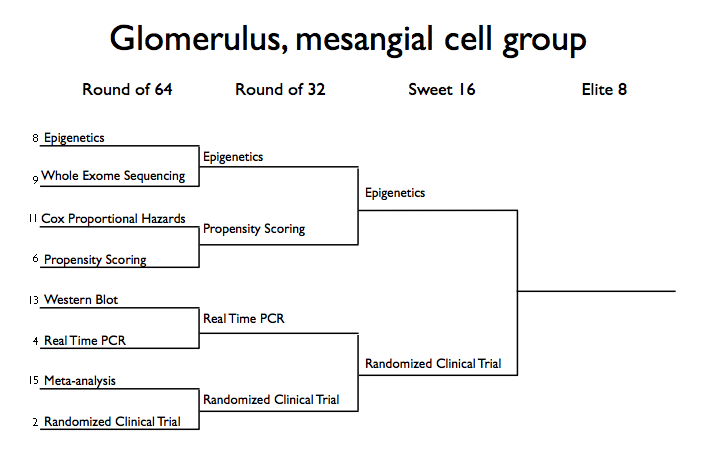 The first round was a close call with number 9 seed, whole exome sequencing, and then another matchup against number 6 seed propensity scoring. Lets look a little closer at what makes team epi-genetics tick. The term epi is derived from the greek preposition ἐπί meaning above. So that epi-genetics is defined as the study of heritable changes in gene expression that are not due to changes in DNA sequence or another way to state it- (above the actual sequence). There are powerful and complex implications of epigenetics that can affect every cell in the body. An example of an epigenetic phenomenon is relatively straightforward. What is the genetic (sequence) difference between a kidney proximal tubule cell and and heart myocyte? They answer is “nothing”. These cells have the exact same DNA, yet are very different cells. They behave differently and this difference has been termed epigenetic. There are two kinds of modifications that can affect DNA. One is a biochemical modification that attaches directly to the DNA itself, termed DNA methylation. The other is histone modification. If histones wrap the DNA very tightly, then it is hidden from the cellular machinery. How the environment impacts this system could provide new clues into the pathogenesis of kidney disease. Some have suggested epigenetic modification plays a role in diabetic kidney disease. The full scope of how epigentics is linked to kidney disease is still being unraveled. The true juggernaut in this region is the RCT. The perennial powerhouse first took down the number 15 seed meta-analysis and then outlasted the one dimensional real-time PCR. Randomization is truly the gold standard when trying to assess evidence-based therapy. However, large-scale clinical trials have been few and far between in nephrology. A study published in 2003 reported that nephrology had the fewest clinical trials of all the specialties in internal medicine. The field has a long way to go to improve its reach in conducting RCTs, but we have seen recent successes. First, the FHN network was an effort to test how more frequent dialysis can impact various patient outcomes and was successful in this regard. Second, the TEMPO 3:4 study looking at the effect of tolvaptan in ADPKD. Lastly, the EVOLVE study was the largest clinical trial in dialysis patients looking at the effect of cinacalcet in cardiovascular and hyperparathyroid end points. The goals of RCTs are lofty and many times even with a large clinical trial we are left with more questions instead of answers. We have relied upon a variety of epidemiologic studies, meta-analyses, observational cohorts and some randomized trials to make the current guidelines in the field. Click here to see the Proximal Tubule Region.